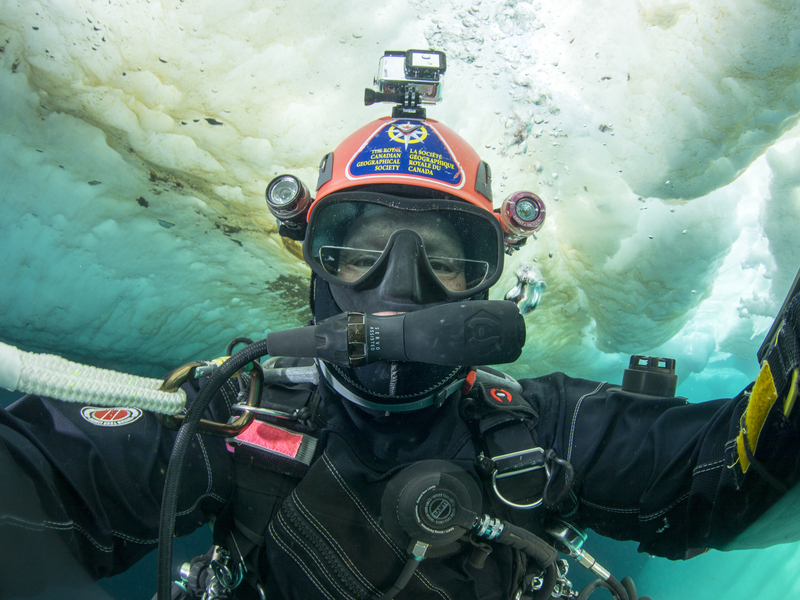 Heinerth photographs the under surface of the sea ice near Bylot Island. As a child, Jill Heinerth dreamed of being an astronaut. As a Canadian girl growing up in the twentieth century, this option didn’t seem accessible to her. Instead of a career that blasted her far above the Earth’s surface, she forged her own path deep within the Earth. She discovered a place where she could still explore hidden worlds, floating weightlessly. Although water is the lifeblood of our planet, we somehow know more about the cosmos than we do about our Earth’s own underwater caves. Jill Heinerth has devoted her life to changing that – one deep dive at a time. Heinerth is the Royal Canadian Geographical Society’s inaugural Explorer in Residence. Although she assumes many diverse roles — from technical diver to photographer to author to speaker — the title “explorer” somehow encompasses it all. In addition to her talent in the arts, Heinerth is one of the most skilled divers in the world. She has logged over 7,000 expeditions through narrow underwater caves, massive glaciers, shipwrecks, and even in the midst of a civil war. To many, the places Heinerth explores are fuel for nightmares. One video of an expedition cheekily opens with a sign reading “STOP – PREVENT YOUR DEATH! GO NO FARTHER.” She nonchalantly bypasses it; the risk is no match for her courage and curiosity. Other footage shows her swimming through crevices so thin that they surround her body, wholly jaw-like. While she insists that a healthy amount of fear is necessary, Heinerth believes that true discovery only lies past the barrier of fright. In fact, that little bit of fear is what lets you know that you’re doing something new and extraordinary. While dauntless, she is far from reckless. In addition to her extensive training, sharp intuition, and strict safety protocols, Heinerth uses state-of the art life support technology. Her gear more closely resembles that of an astronaut than a recreational diver. She relies on rebreathers, which recycle her exhaled carbon dioxide into useable oxygen. This technology allows her to dive for up to 20 hours long. Yes, she does bring snacks. The discoveries that surface from Heinerth’s dives are of great interest to a range of scientists. Biologists are fascinated by the animals she encounters, as they are often foreign to anything seen on land. Many of these species are found only in one cave system, and often, they are consistent in the fossil record since before the age of the dinosaurs. Evolutionarily, they must be doing things right – what can we learn from them? Cave exploration also provides cultural and geological insights into the past. Paleontologists and archeologists study the fossils and artifacts she finds to fill in missing pieces in the history of life; sometimes she even discovers human remains! Geologists are equally captivated by the forces that created these unique landscapes. Clearly, underwater caves tell expansive, eons-long stories about our Earth and its past. Even small-scale discoveries are intriguing; Heinerth once collected a rock which, three months later, popped a tiny, live octopus out of its pores. While she continues to dive and explore, that is only a part of Heinerth’s career today. As an accomplished speaker, author, filmmaker, photographer, she is first and foremost an advocate for water literacy. “As a cave diver, I swim through the veins of Mother Earth,” she often remarks, and her passion for protecting this lifeblood drives every outreach project she undertakes. While she has already established herself as a groundbreaking explorer, her legacy may grow most from these educational efforts. She has inspired millions of people to push boundaries, overcome fear, and care for the planet. In our age of freshwater scarcity and climate uncertainty, there are few more important impacts to make.